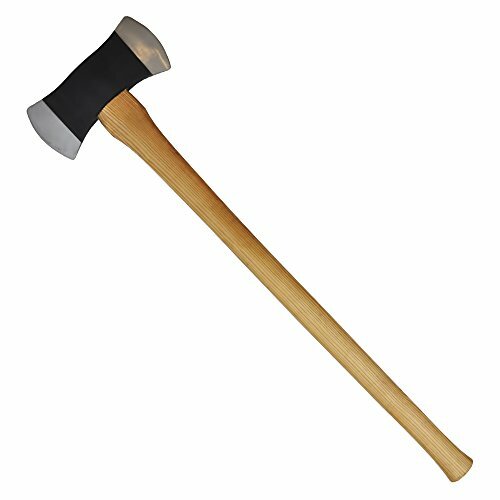 This is a double head axe with 3.6lb. The double bit axe is composed of two blades. One end is thinner and sharper and used for knot-free cutting; the other end is thicker and blunter andis used when knots are present or to cut near the ground where contact with dirt was likely. This tool is mainly used by professional lumberjacks. The beauty of this double bit axe is that you have the option to profile the blades differently. You can reserve one blade side for blade-dulling heavy work such as splitting and chopping and the other blade for sharp, fine cutting. The double bit axe is compact enough to carry all day in your hand or strapped to your pack. The axe has a fully drop-forged double-sided bit head that provides more power than a traditional head. Double-bit head is well-balanced and the head of axe is constructed from drop-forged steel with a rust-resistant black finish. It can take high-impact and is shatter-proof to provide more durability than traditional wooden handles. It is more streamlined for chopping and easy to chop kindling, clear roads and trails, to build blinds and even to chop down a fair sized tree. If you have any questions about this product by SNOWMUS, contact us by completing and submitting the form below. If you are looking for a specif part number, please include it with your message.